We are seeking an experienced architect to join our team in London. Nex is an architecture and urban design studio working on special projects inspired by place, people and atmosphere. Our buildings and projects connect architecture to the city by closely integrating with the public realm, and current work includes projects in arts and culture, learning, leisure, work and transport. 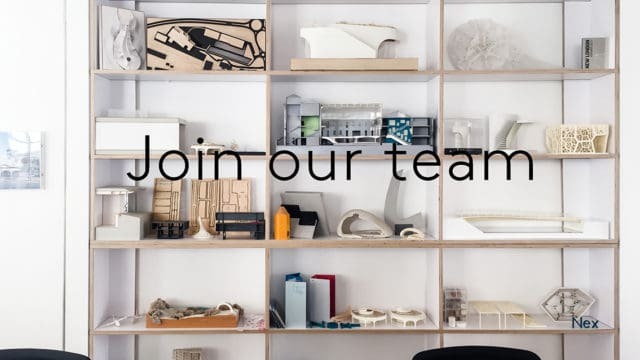 We have a vacancy for a talented Part III qualified architect to become a key member of our friendly team in our central London studio. The successful candidate will have the opportunity to work on a diverse range of project uses and scales, following projects from concept through to construction. ability to sketch freehand and communicate your ideas graphically. We offer a great studio environment with the opportunity to flourish, a close-knit team and a competitive salary based on your experience and accomplishments. We are looking for a long-term commitment from a candidate who will have the opportunity to grow into a senior role as we expand. Total file size should be under 10MB. All applicants must be based in the UK. We are an equal opportunities employer.